Lap seam sealant and repair sealant. All types of waterproofing applications. 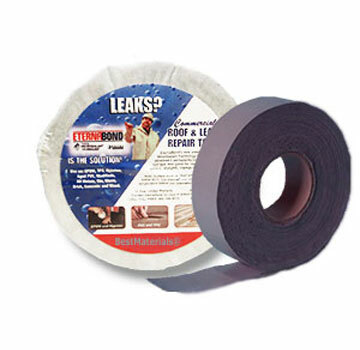 General purpose seam sealant / waterproofign in tape form. Sticks or Re-sticks anything to anything (except silicone surfaces). Extreme weather sealant. UV resistant. Bonds metal, rubber, plastic, wood, glass, painted surfaces, concrete, tile, shingles, asphalt surfaces, EPDM, TPO, underwater repairs, etc. Primer is recommended with TPO. Limitations: not for use over silicone surfaces; not a structural adhesive (its permanently soft and elastic, it will stretch under load). FEATURES: Eternabond's DoubleStick is an extremely aggressive high performance sealing adhesive. It never cures or shrinks. Stays permanently soft and elastic. Self Priming. Can be used WITHOUT primer on all types of flat roof systems. Sticky on both sides, and is used as a lap seam / asphalt shingle repair adhesive sealant. DoubleStick is also ideal for marine applications and forms permanent seals to all types of materials (except silicone surfaces). DoubleStick can be double-layered, stacked, folded or rolled into a bead for areas that need a thicker sealing area. Moldable 2-sided permanent gasket material. Seals any 2 opposing surfaces to form a permanent watertight seam. Seals, waterproofs and repairs any surface. 60 mil thick product sticks to granulated shingles. It also easily stacks or folds to increase thickness as needed.